A SMALL GROUP of people believe in them. The discovery of the existence of the creaturesEVshas changed their lives. They devote their time to making websites about them; they defend them from destruction. These people are not religious zealots or people who see "little people," they are simply people who love their electric vehicles. Marc Geller is one of the believers. We spoke over the phone in a conversation that can only be called a massive download that made me want to go take a nap. It was all about the last four years in the life of an EV advocate, and he has done a lot of great work. 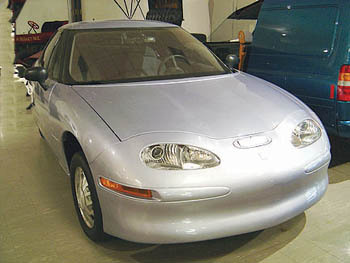 Geller replaced his 30-year-old Citroën with a Think cara plug-in electric vehiclein 2001. Later, when Ford began to call back the Thinks, Geller got involved with the campaign to stop them from being crushed. He noticed then that the Sierra Club had started their JumpStart Ford campaignan effort to sway Ford to make more fuel-efficient cars. The environmental group suggested 50 miles per gallon by 2010 and zero-emission cars by 2020. "I went in and told them, look, I drove here on a zero-emission car today," Geller said. "It can be done today." In the past couple years, a ragtag group of EVers has also held month-long vigils in Sacramento to stop Ford from taking people's leased electric vehicles (successful: Ford eventually sold the owners the trucks for $1), attempted to save 77 GM EV1 (failed, but got lots of press) and tried to sway Toyota from taking back their fleet of RAV4s (partially successful). Most recentlyand why I'm writing this nowthe EV fans were also part of the Sierra Club Expo that I covered a few weeks ago. Why don't you remember hearing about them? Because I didn't know where to look! While I drove a $1 fuel-cell car that I'll never get to drive again because I'll be dead before they make one I can afford, the EV crowd plotted in corners. They appeared on the second and third day of the show and gave almost 100 Expo-goers rides in electric Ford Rangers and RAV4s. The Sierra Club was not happy. The EVers had a bullhorn. It was a collision of philosophies, with the EV representing the absolute, the punk-rock ethos of the environmental movement, while Sierra Club took a less strident approach. An uneasy alliance has formed between the Sierra Club and the automakers that people like Geller hate. "The car manufacturers rub their hands after every meeting with the Sierra Club," he said. The EVer behind the bullhorn said, "Welcome Sierra Club members. Walk past the gasoline cars and drive a true zero-emission vehicle." Sierra Club spokesman Dan Becker explained his group's position. "We're a nationwide organization, and we need to come up with a cleaner solution for everyone." That solution happens to be gas-electric hybrids for the Sierra Club. "Nobody makes electric cars anymore," Becker said. "We have to walk before we run. Right now, 1 percent of cars in the United States are hybrids. First, let's do what we know how to do, using existing technology." Geller loves his RAV4, which gets 120 miles per plug-in, which is what 95 percent of people need 95 percent of the time, he saysa car that takes you to work and back. He also pointed out that the power grid is fired up all the time, with the grid below capacity at night, which is when the plugged-in cars would get juiced up. If you want to buy an electric car, it's going to be tough. Geller suggests finding a Ford Ranger EV or a RAV4 that was used in a fleet. They they cost $40,000, same as when they were new. Check out www.pluginamerica.com for more EV information. Remember when Elliot from the movie E.T. turns to his mom and says, "We're dying," while he holds his potato-shaped friend's pale beige hand? This was and still continues to be the situation for EV fans. Maybe if enough people believe, we'll all start to see EVs. Turn on your heart light. From the October 12-18, 2005 issue of Metro, Silicon Valley's Weekly Newspaper.